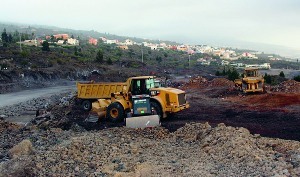 According to the department for public works and transport, work has already begun on the road which links the island ring road, which is being constructed between Adeje and Santiago del Teide with the new port at Fonsalía. The five kilometres stretch, with a six per cent gradient, will descend to an area between Playa San Juan and Alcalá connecting directly with the port, allowing a high speed connection between the TF-47 and the southern motorway. The new road will have dual lanes on the climb and one on the descent. It will join the ring road which will have dual carriageway lanes in both directions. There will be no urban junctions or roundabouts, making an average saving of journey time of more than ten minutes. Work has been going at a good pace for the past four months in the area of Armeñime. Speed has been restricted on the stretch between the end of the motorway and Los Menores while a diversion road is created allowing traffic to flow while work continues on the main section. Work is also under way between Los Menores and Tijoco. According to the department of public works, earth moving is well advanced and many drainage works and underpasses are complete. Work is also well advanced between Tejina de Isora and Arguayo where many ravines have been crossed and underpasses completed. The southern section of the island ring road is supposed to be completed within 36 months and has a budget of 167.8 million euros. and there are few happy with the valuation. Property owners in Santa Barbara, El Paso and Las Lajas seem satisfied with the offer although the president of the association fought for fair compensation and believes those with smaller properties should still demand better valuations. The majority have been offered €785 per sq. metre and some are valued at €985. They feel the offer is insufficient and unjust. Property owners are determined to fight for more cash for their houses and agricultural plots or to actually halt the construction of the ring road altogether. Four years ago one family purchased a house with farmland and invested €200,000 on refurbishing the house, they were not told of the plans for the road at the time of purchase. 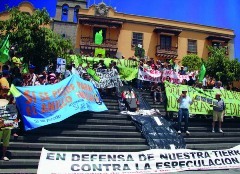 However, the governing coalition at Icod de los Vinos council issued a statement promising to meet each and every family which feels it has been hard done by with the valuations. The council will then study their cases individually and negotiate with the regional authorities, if necessary, for better terms.